It turns out that all rules have exceptions. 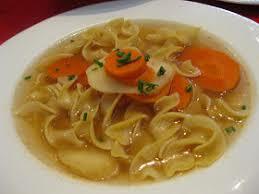 And the exception to the Alexander-eats-no-green-veggies rule is that he dearly loves stuffed cabbage. Weird, I know. I made a version of the stuff that he scarfs with delight, and it delights me to see him eating a green vegetable! The difference between Hungarian stuffed cabbage recipes and Polish/Russian ones is that the Hungarian taste tends toward the savory, while the more traditional stuffed cabbages are sweet, most often sweetened with brown sugar. This sweet tomato flavor is, to me, too cloying. In fact, while some people love this flavor, this is one that had me for my whole life thinking I didn't like stuffed cabbage. But once I sampled the Hungarian version, I was happily surprised. In a deep oven-ready saucepan, combine the tomato products, bouillon, 1 tablespoon paprika and let it simmer. In a separate bowl, combine the uncooked beef with the thyme, marjoram, salt, pepper, 1 tablespoon of paprika, minced onion, egg and cooked rice. Using a soup spoon, fill the cabbage leaves, fold them like a burrito, and place gently, fold side down, into the tomato sauce as you finish. When all the cabbage leaves are filled and the meat is all used up, transfer the whole thing to a 350 degree oven for one hour. Serve to enthusiastic fans. Easy weeknight tip: If you don't feel like stuffing the cabbage leaves, you can make the equally lovable "unstuffed cabbage," a specialty of my friend Randi. She just cuts bite sized pieces of the cabbage and adds them to the tomato mixture, and makes free form meatballs from the meat mixture. It's equally delicious! Sweeten up tip: If your grandmother was from Poland and your tongue craves the sweeter version of stuffed cabbage, dissolve two tablespoons of brown packed sugar in the tomato sauce before adding anything else. It's much, much easier to freeze the cabbage than to boil it. If you freeze it solid, then defrost slowly, the leaves come apart intact. 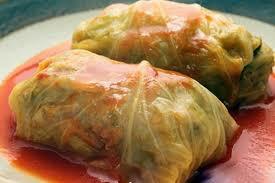 Easier to check for insects, easier to make the actual cabbage rolls--what we call Holepches.